EEE! Ok, so, today is Vince (Michael's cousin)'s rehearsal dinner, so I'm of course busy busy busy. But guys, I have a TREAT for you today: my girl Jennie from The Messy Baker is here to share one of her FABULOUS recipes with you guys! AREN'T YOU EXCITED??! I love Jennie. Like oodles. Bunches and bunches. We need to meet asap. And you wanna see something adorable? This is the very first comment she left on here, (in response to a comment I had left on her blog after stumbling upon it), and thusly began our friendship. Cute as crap, right? Ok, enough from me, on to Jennie and cookies! Hello, Cooking Actress fans! I’m Jennie. Nice to meet ya. I’m the baker, spatula licker, and taste tester over at The Messy Baker. Today I’m filling in for my gal Kayle. She’s off doing her thang, so I’m here to provide you with mucho deliciousness today. I’m a frequent flyer here at The Cooking Actress. I just can’t get enough of Kayle’s cookies, pies, cakes, and savory eats. The girl knows how to cook some tasty grub. Her beau Michael is one lucky guy. Kayle and I met over the interweb almost 2 years ago through our blogs. It was love at first sight. One look at her list of cookies, and I was in it for the long haul. After that first day, there was no keeping me away. So, in the spirit of good cookies and in honor of Kayle, I decided to keep up with the tradition and make a cookie recipe to add to her ever-growing cookie list. 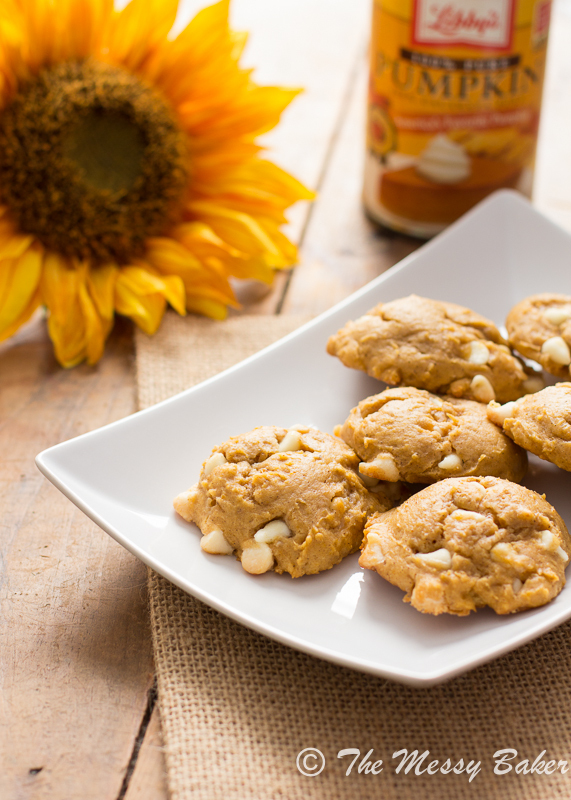 Enter pumpkin cheesecake cookies. Go ahead, I’ll wait while you read that again. Yup, pumpkin cheesecake cookies—a soft, spicy cookie that combines the flavors of fall and the rich, creaminess of cheesecake in portable form. Say what! You’ve heard of that slightly famous roll that makes an appearance during the fall and winter holidays—pumpkin roll. 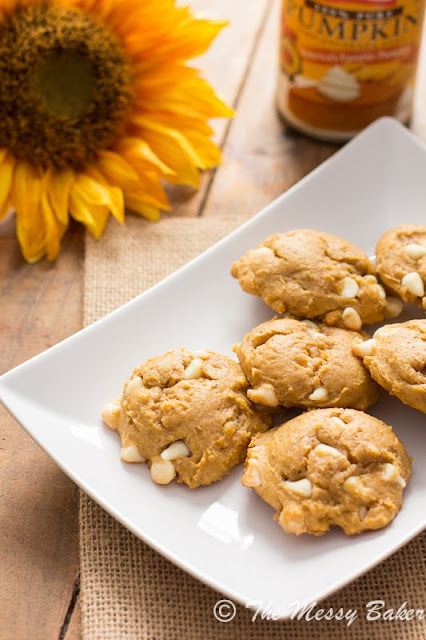 Yeah, these cookies taste just like that…all soft and creamy with hints of cinnamon, cloves, nutmeg, and ginger. These cookies are so moist that they melt in your mouth as you eat them. They have a delicate, tender crumb that will keep you coming back for more. One, two, three cookies, gone! A big thank you to Kayle for inviting me to post on her behalf, and a big thank you to you, her readers, for having me. I hope you guys enjoy the cookies as much as my family and I enjoyed them. In the bowl of a stand mixer fitted with the paddle attachment, cream together butter and cream cheese until combined and slightly fluffy, about 3 minutes. Add the brown sugar and granulated sugar and whisk on medium high speed for an additional 2 minutes. 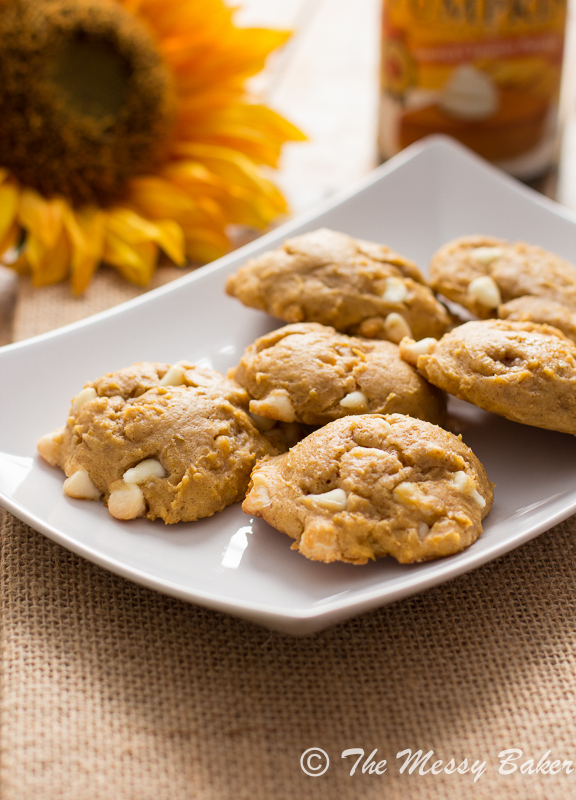 Slowly whisk in pumpkin puree, egg, and vanilla until just combined. Scrap down the bowl and give the mixture another good mix. In a medium-sized bowl, stir together flour, baking powder, baking soda, salt, pumpkin pie spice, and cinnamon. Slowly add the dry mixture to the wet mixture in three batches, scraping down the bowl after each addition. Fold in the white chocolate chips. Transfer the dough to an airtight container or cover with plastic wrap and store in the refrigerator for at least 2 hours to chill the dough (DO NOT skip this step). Preheat the oven to 350 degrees F. Line a baking sheet with a silicone mat or parchment paper. Using a 1-tablespoon cookie scoop, scoop the chilled dough onto your prepared pan, spacing the dough balls 3 inches apart. Bake one sheet of dough at a time, storing the additional dough in the fridge in-between baking. Bake the cookies for 13 minutes (no longer than 14 minutes). Cool on the pan for 3-5 minutes before transferring the cookies to a wire rack to cool completely (see notes). Store the cookies in an airtight container, separating the layers with parchment so the cookies won’t stick together, for up to 5 days. Note: It is very important to cool the cookies completely before storing them. 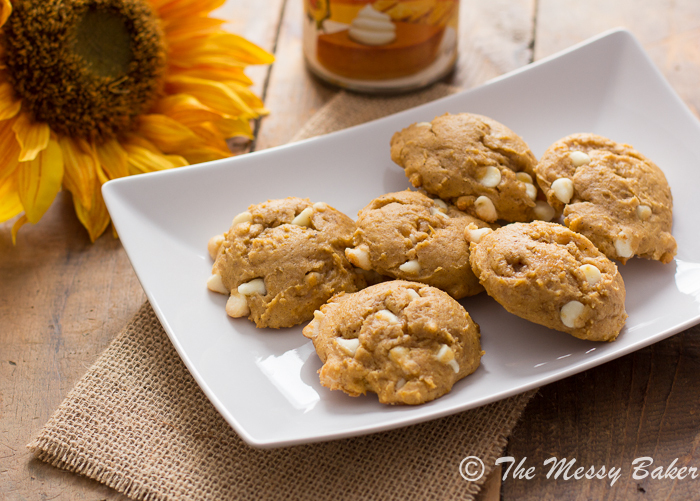 If they don’t cool completely, you risk having over moist, mushy cookies. I let my cookies cool on the wire racks for an hour before storing them.